We are critically aware of the growth in stored data volumes putting pressure on IT budgets and services delivery. Burgeoning volumes of unstructured data commonly drive this ongoing trend. However, growth in database data can be expected as well as enterprises capture and analyze data from the myriad of wireless devices that are now being connected to the Internet. As a result, stored data growth will accelerate. Object-based storage systems are now available that demonstrate these characteristics. 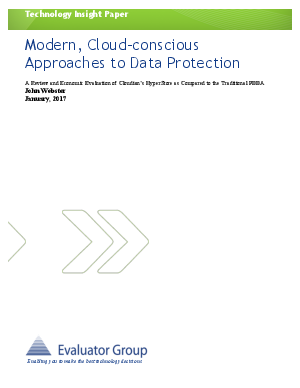 While they have a diverse set of use cases, we see several vendors now positioning them as on-premises targets for backups. In addition, integration of object-based data protection storage with cloud storage resources is seen by these vendors as a key enabler of performance at scale, cost savings, and administrative efficiency.